60 x 50mg Veg. Caps. Each vegetable capsule provides 50mg of Q10 with wild Rosehip, no other additives of any kind. Take one capsule a day with meals, more if required. Co-Enzyme Q10 is important for maintaining a healthy heart and energy release as we age. It is acknowledged that the bodyâ€™s ability to produce its own co-enzyme Q10 diminishes with age. Recent research indicates positive results in controlling higher blood pressure. Co-Enzyme Q10 helps to maintain a healthy cardiovascular system, and benefits patients with cardiovascular disease, with benefits for hypertension, hyperlipidaemia, coronary artery disease and heart failure, and treatment with lipid lowering statin drugs. Co-Enzyme Q10 promotes normal immune function (cells involved in immune response have a high energy dependence), and benefits patients with breast cancer. Co-Enzyme Q10 is an important antioxidant found in high concentration in human heart and liver, kidney, spleen and pancreas tissue. Co-Q10 is part of the cellsâ€š electron transport system. Co-Q10 is a powerful antioxidant that can decrease the proliferation of free radicals and lighten the load on the immune system. Co-Q10 is not found just within the cellsâ€š organelles, but also is naturally present in the cell membranes. Another function of Co-Q10 is to make sure the cellsâ€š plasma membrane remain flexible. The fluidity of the membranes is crucial for proper physical performance because membrane fluidity affects membrane receptors, carriers and enzymes. * Coenzyme Q10 helps to maintain a healthy cardiovascular system, and benefits patients with cardiovascular disease, with benefits for hypertension, hyperlipidaemia, coronary artery disease and heart failure, and treatment with lipid lowering statin drugs. 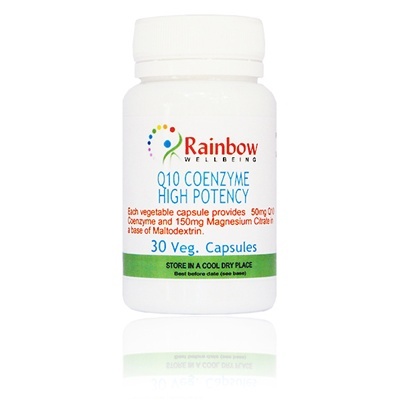 * Coenzyme Q10 promotes normal immune function (cells involved in immune response have a high energy dependence), and benefits patients with breast cancer. 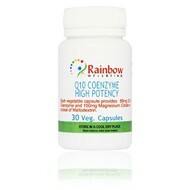 * Coenzyme Q10 inhibits the development of periodontal disease. * Coenzyme Q10 benefits patients with Parkinsonâ€™s disease. 50mg of Q10 with 475mg of wild Rosehip. Take one capsule a day with meals, more if required.